Vint Cerf’s SU lecture is now free to view online. Stern glances still have to be acquired in person. If there’s one thing all the future gurus seem to agree on, it’s that the democratization of technology has the ability to improve everyone’s quality of life. Access to information is really the first step towards self-empowerment. It’s very fitting then, that Singularity University, who’s goal is to harness the exponential growth in technology to solve humanity’s grand challenges, has decided to place some of the lectures from the summer session online. SU’s YouTube channel recently saw the addition of full length videos for the presentations by Bob Metcalfe and Vint Cert. Make some time for both videos, they are long but very informative. We’ve embedded them after the break. It’s unclear if all of the Singularity University lectures will eventually go online, but these two videos alone are a pretty cool freebie. SU costs around $25k for nine weeks of lectures, exercises, field trips, experiments, and discussions. The first year summer session recently finished with remarkable success. While you can’t get the same experience from YouTube, it is a great way to see what Singularity University is all about. Bob Metcalfe is the founder of 3Com, co-inventor of ethernet, and has many other credentials to his name. His lecture focuses on how the lessons we’ve learned from the growth of the internet can help us when pursuing abundant energy. This ‘Enernet’ concept is still being developed, but Metcalfe does a good job of highlighting how 63 years of information technology could guide us through our energy crisis. If you’re in a hurry, you can probably skip the opening banter and go to 5:40 to get started. 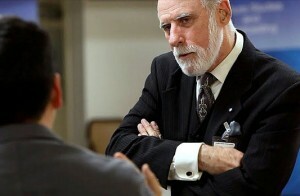 Vint Cerf is the ‘father of the internet’ and currently serves as Google’s Chief Internet Evangelist, a job that places him on an extensive lecture circuit. His discussion focuses on the history of the internet, it’s current state, and how this information can help us predict its future. Whether its IPv6, cloud computing standards, the rise of Asian dominance of the internet, or a future interplanetary system, Cerf is the guy you want to explain these things to you. Enjoy the entire video, but those familiar with internet history should probably skip ahead to 4:35. Online lectures are changing the face of education. This trend includes institutes like the University of Phoenix, or Capella University that have helped define online learning as colleges available almost exclusively via the internet. Yet most of academia is transitioning to placing important resources online. Lectures, quizzes, and discussion groups routinely occur in virtual space. For students in academia, virtual access is a convenience bordering on necessity. For the rest of us, online material represents a (typically) free ticket to continue our education with high quality sources. As cool as it is to jump on Wikipedia and get a condensed look at a topic, having access to a deeper fount of information is even better.